When crisp graphics, fine detail and true colour are important to business, Canon’s imagePROGRAF TX-3000 presents the ideal solution. 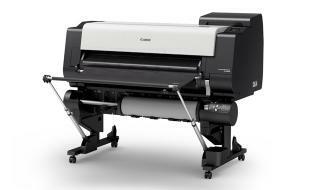 Printing CAD drawings, GIS and posters to 36” with accuracy and speed, this large format printer delivers on excellence. Dual rollers, flexible media options and smart management tools improve uptime for productivity. Load two rolls of media then get back to business while your smart printer makes the decisions about the best media to use for each job in the queue. Using economical ink, your TX 3000 produces fine lines , sharp text and crisp clear prints on uncoated or coated stock that are ready to take with you on site. Your compact printer easily fits into a small space and takes its orders via an intuitive touchscreen. With dual roll feeding it just won’t stop. The TX-3000 never misses a beat, with class-leading uptime, user friendly controls and impressive security for data transmission, storage and erasure. Interested in the Canon iPF TX 3000?